Sculpture and plaque in the Keeper of the Plains Plaza, Wichita, KS. 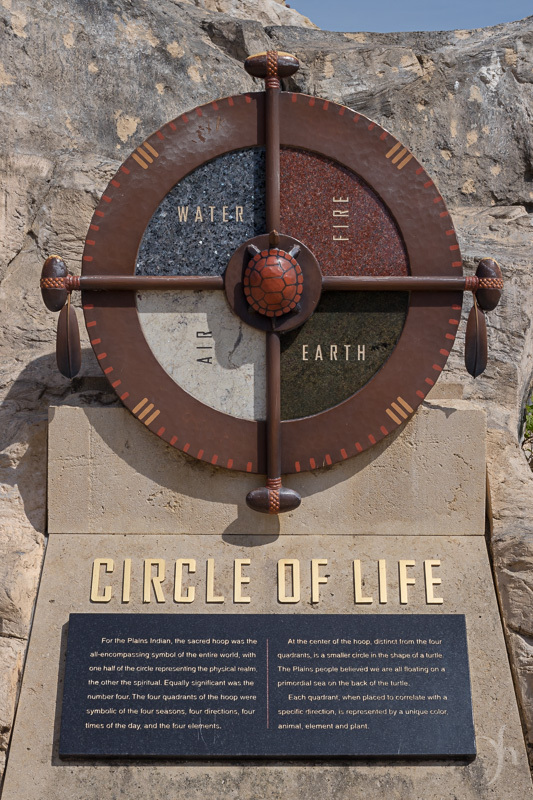 “For the Plains Indian, the sacred hoop was the all-encompassing symbol of the entire world, with one half of the circle representing the physical realm, the other the spiritual. Equally significant was the number four. The four quadrants of the hoop were symbolic of the four seasons, four directions, four times of the day, and the four elements. “At the center of the hoop, distinct from the four quadrants, is a smaller circle in the shape of a turtle. The Plains people believed we are all floating on a primordial sea of the back of the turtle.